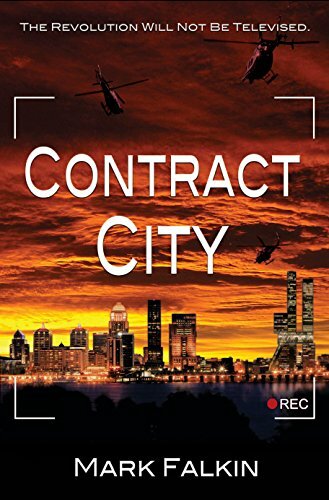 Contract City is a book about a seventeen year old girl named Sara Christie. She hopes to get into UCLA and thinks that making a good documentary will strengthen her application. Her documentary is about the mysterious tags, WH2RR? ?, that are popping up all over her hometown of Tulsa, Oklahoma. The film is going great, until one day, she is secretly filming her dad, who is an FFT agent (Free Force Tulsa). He is looking at one of the tags. As soon as her dad walks away, a group of other FFT agents spot her and start to chase her, but aren't able to catch her. Soon after, Sara finds a text on her phone, threatening that if she doesn't give them all of the footage she had shot, then they would track her down. Heedless of the threats and more determined than ever, Sara films more footage for her video, but in doing so, she finds herself more hopelessly entangled then she ever could have imagined. What do the WH2RR?? tags even mean, and why do the FFT agents care so much about them? What is FFT going to do to Sara? Will this documentary even help with her UCLA application? Find out in Contract City! Personally, I didn't really like Contract City. Some of the things that I didn't like about it were that the storyline was really hard to follow and it got really slow during most of the book. Also, I really thought that it ended terribly; there was a huge jump in time right when there was a lot of action going on. Maybe if there had been one more chapter between the second to last chapter and the last chapter it would have been better. Also, something happened in the end that I didn't really think should have happened. Most of the people in this book were drinkers and smokers, which was another thing I didn't like about this book. Lastly, I didn't like that I couldn't really understand most of the personalities of the characters, including Sara, which was disappointing because she was the main character. The book started to get better about two thirds of the way through the book because it started to speed up and added more action; unfortunately, it bombed with me before and after that. I would give this book a two and a half star rating if possible, but since it is not, I will give it three stars. There was smoking, alcohol, drugs, bad language, some death, two people that were naked and some other mature content.